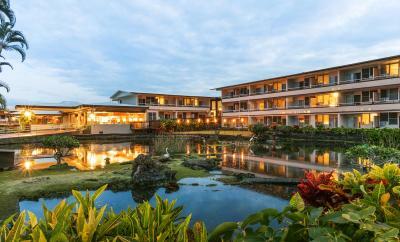 Lock in a great price for Hilo Seaside Hotel – rated 8.3 by recent guests! It was near the venue that I was attending. My granddaughter's sheet had blood on it. Won't be back there again. Seemed like forever to reach our room expected more for the price I paid. The staff is the best! It’s like staying at a relatives house. Everyone is so friendly. They are renovating the front desk lobby but the clerks did not skip a beat. Check in was quick and easy and staff are always accommodating! Way better than any hotel on that side and less expensive. Front desk staff full of genuine aloha, not just for sales. Housekeeping, sevurity and maintenance too. Grounds are beautiful and great food in restaurant. Only place I'd recommend on east side! The parking was free. It was quiet & comfortable. The gardens and pond were nicely landscaped. We had a private room right on the pond with a nice view. It was a great place to stay for the night. The hotel is still renovating, and will look great when finished. We had the Superior room which was 2 full size beds. Room a little out dated but very comfortable and clean. Front desk employees were very welcoming and friendly. We enjoyed our stay. Location, and it had a restaurant onsite. Staff was friendly even though hotel was going through a renovation/update. Restaurant staff was very friendly and attentive. It was a standard Holiday Inn with a good location close to bars, restaurants, and a public beach. New amenities in the rooms (upgraded). The staff provided me a room close to the parking with not a lot of stairs for my senior citizen mom. Hilo Seaside Hotel This rating is a reflection of how the property compares to the industry standard when it comes to price, facilities and services available. It's based on a self-evaluation by the property. Use this rating to help choose your stay! A short distance from breathtaking waterfalls and within driving distance of Hawaii National Volcanoes Park, Hilo Seaside Hotel offers comfortable accommodations and a swimming pool. Free WiFi and guest parking are available throughout the property. Featuring a balcony, all rooms includes a refrigerator, a coffee machine, a TV, air conditioning and a ceiling fan, ironing facilities, and an private bathroom complete with a hairdryer. Select rooms offer an alarm clock radio and views of Hilo Bay or the pool area. An outdoor swimming pool is available to guests, as well as on-site laundry facilities. Guests at the Hilo Seaside Hotel can enjoy on-site dining at the Coconut Grill. The Hilo Seaside Hotel is located only a short distance from the Rainbow and Akaka Falls. The Hilo International Airport is 2.3 mi away from the property. When would you like to stay at Hilo Seaside Hotel? Featuring a balcony, this room includes a seating area and an private bathroom. Tea and coffee-making facilities are also provided. Rates are based on single/double occupancy and subject to an additional extra person charge of USD 20 per night for a third adult. This room is located near the lobby. Offers views of Hilo Bay and/or the pool area. Bed type preference cannot be guaranteed as it will be allocated upon arrival based on availability. Rates are based on single/double occupancy and subject to an additional extra person charge of USD 20 per night for a third adult. House Rules Hilo Seaside Hotel takes special requests – add in the next step! Hilo Seaside Hotel accepts these cards and reserves the right to temporarily hold an amount prior to arrival. There is a limited amount of free parking available at the Hilo Seaside Hotel. For rates that include breakfast, the daily breakfast is for 2 (two) guests per room. Breakfast can be purchased for any additional guests, including children, at the hotel. Though our room itself was fairly modest (possibly due to the room option we chose), the hotel itself was frankly amazing for the price range. A lovely and quite large koi pond, a large and pleasant lobby, a garden path, a very inviting swimming pool, and even a mini-museum room add quite a bit to the feel and mood of the place. We enjoyed our stay very much and would absolutely go out of our way to stay here again. Also, the cleaning staff did a great job, especially in comparison to the HNL hotel we stayed in just prior. If you like to read, be sure to check out Hilo Bay Books near the corner of Hawaii Belt & Leilani - I found five "have-to-have" books in about as many minutes, including an English book on Chinese cursive writing from the 50s, the type of book I've been searching for for ages. Also, forget Take-no-ko (you won't get in anyway) - go get sushi at Sakura, about a block away from the hotel. Literally the best sushi I've ever had, and with amazing presentation. Also recommend Hawai'ian Tropical Botanical Gardens, just a couple miles north. Cheap prices equals cheap, uncomfortable, tacky hotel. Lousy mattress. Planes feel like they are landing on you. Pool ok but not for laps. Good breakfast and very helpful , friendly staff. The price of the room. Construction going on and the hotel looked a little run down. No bottle opener in room. Very difficult to navigate for elderly. We didn't realize how many areas had stairs! The check in wasn't that sympathetic that I was having problems with my credit cards and was I alone so it was stressful. There were no bikes available to rent this should have meant a reduction in price. No air con. The hotel is like an American motel but Hawaiian style. Beds comfortable, and good breakfast. Pretty flowers with native trees in the hotel. Quiet. Has a TV in the room, pool and hot showers. Comfortable. Cleaning staff were friendly. Rooms are outdated. Wouldn't stay here if I was traveling alone. Rooms are old but clean. It was noisy but overall ok. Grounds are beautiful. Great breakfast in the attached cafe. Very clean. Bed was comfortable. Air con was difficult to understand.